COPYRIGHT KEVIN AVERY 2011 - 2016. Everything Is an Afterthought: Editor’s Choice, The New York Times Sunday Book Review; one of Library Journal's best books of 2011; listed in Ken Tucker’s Top 10: The Year in Music on NPR’s Fresh Air; one of Rolling Stone's best rock books of 2011. In 1976, the critic Paul Nelson spent several weeks interviewing his literary hero, legendary detective writer Ross Macdonald. Beginning in the late 1940s with his shadowy creation, ruminating private eye Lew Archer, Macdonald had followed in the footsteps of Dashiell Hammett and Raymond Chandler, but ultimately elevated the form to a new level. 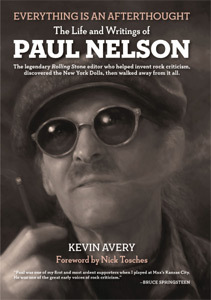 "We talked about everything imaginable," Nelson wrote―including Macdonald's often meager beginnings; his dual citizenship; writers, painters, music, books, and movies he admired; how he used symbolism to change detective writing; his own novels and why Archer was not the most important character―"my God, everything." "Ross Macdonald, in the view of many, was the greatest detective-novelist ever—an author who earned a place amongst the best fiction-writers of his time. "Paul Nelson was a highly regarded journalist and critic for Rolling Stone and other counter-culture publications of the 1960s and '70s. "In 1976, these two writers came together for a series of interviews in which Nelson induced the taciturn Macdonald, a man of formidable intelligence, to speak at length and in gratifying detail on all manner of topics: autobiographical, sociological, aesthetic, and (especially) literary. 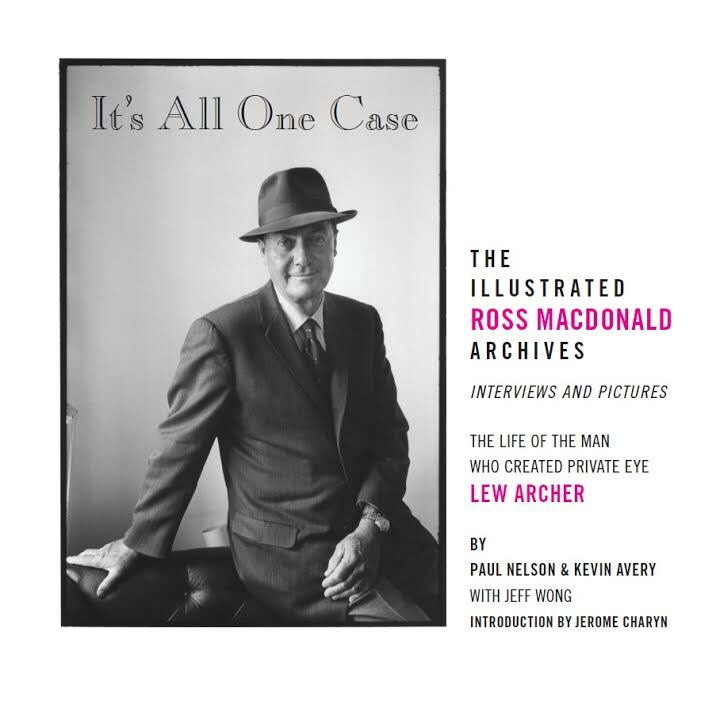 "The stimulating and absorbing results of their many hours of talk are presented now in It's All One Case, edited, annotated, and introduced by Kevin Avery, whose devotion to Paul Nelson's legacy is as notable and admirable as was Nelson's interest in Ross Macdonald. In 1979, Paul Nelson embarked on an a series of interviews with Clint Eastwood that lasted until 1983 and that, until now, remained unpublished. Back then, few of Eastwood's critics could have predicted—nor would they most likely have gone on record if they had—that the actor-director would ever be taken as seriously as he is today. But Paul Nelson did. "Paul Nelson was the first serious film aficionado who, way back in the early 70s, turned me on to the importance of Clint Eastwood as an actor, filmmaker and American icon. He showed me the S&W Magnum .44 he kept under a pile of sweaters in his closet. ‘Same as Dirty Harry,' he said, explaining that if he was going to write about men with guns he had to know how it felt in his hand. We were both devoted to F. Scott Fitzgerald and hoping that Clint Eastwood would play Gatsby in the upcoming film, which, of course, he didn't. "This is a rich and mysterious book. Kevin Avery has glimpsed Nelson's soul, and the image he presents is fascinating and deeply human. Avery's respect (and affection) for Nelson is evident, but the details he presents of this elusive man's life are effectively clear-eyed. We sense the joy in Nelson's creative gift and equally shiver in the shadows of his dark side. Visit Fantagraphics Books' Paul Nelson page. 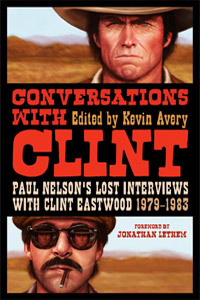 Kevin Avery is the author-editor of Everything Is an Afterthought: The Life and Writings of Paul Nelson, Conversations with Clint: Paul Nelson's Lost Interviews with Clint Eastwood, 1979 – 1983, and most recently It's All One Case: The Illustrated Ross Macdonald Archives. 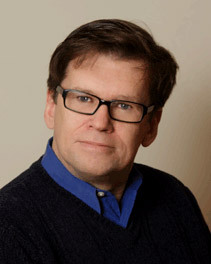 His has also written for publications as diverse as Mississippi Review, Penthouse, Weber Studies, and Salt Lake Magazine. He's currently at work on a novel. Born and raised in Salt Lake City, Utah, Kevin moved to New York in 2005 to get married and to pursue his writing career. He lives in Brooklyn with his wife Deborah and a four-legged muse named Mysti.